Summer = fresh berries. YAY! It is finally strawberry season here in Maine which means it is time to pick, pick, pick and jam, jam, jam. It would be silly not to eat as many berries out of hand as possible during the fleeting season. Strawberry Shortcake is the perennial favorite so this dessert might be considered a bit daring in the sense that it does not involve any whipped cream. Trust me you will not miss it. 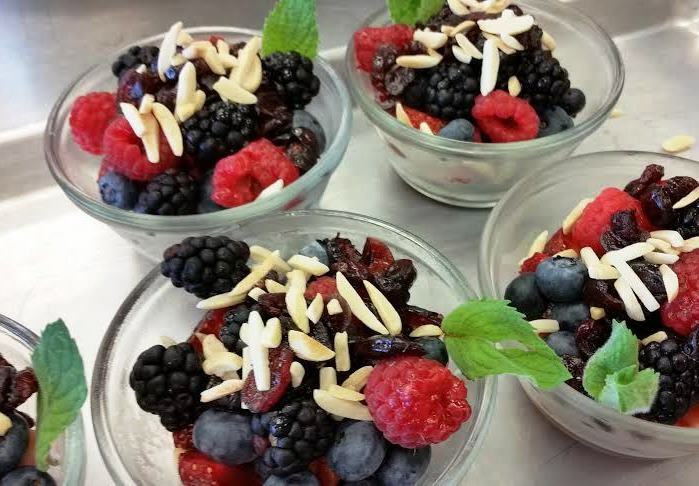 These berry cups can be prepared ahead of time and chilled until needed, simply sprinkle the toasted almond garnish on before serving. Divide the berries between glass dishes. Spoon the cranberries over the berries. Refrigerate until needed. Garnish each cup with a sprinkling of almonds.